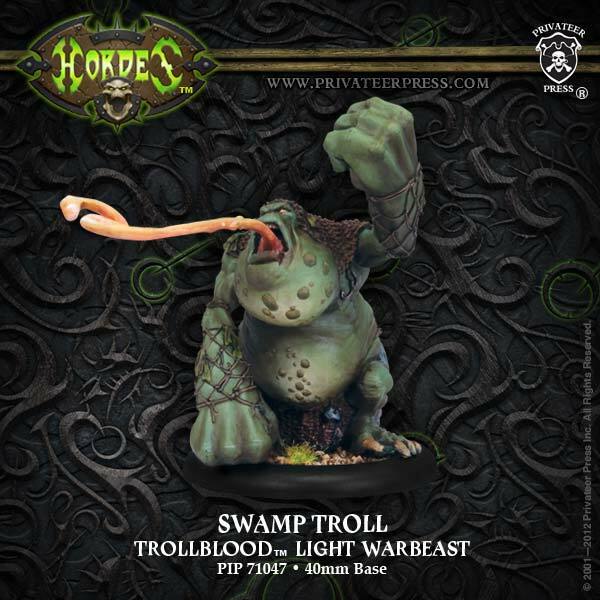 This weeks figure is a Privateer Press Hordes Swamp Troll. I decided to make him light-skinned because he lives in caves or in a jungle so dense the swamp troll rarely sees sun, he even has algae growing on his skin in places. Swamp trolls are aggressive predators that attack living creatures on sight (especially when hungry). When hunting a swamp troll moves quietly along, easing closer to its prey and then finally striking with its claws and bite when within range. Swamp trolls rarely fight to the death unless threatened or hungry. Swamp Dependent (Ex) Swamp trolls keep their bodies covered in a thick coating of mud and swamp water. Without such a coating, they lose their regeneration ability and eventually suffocate. They can survive away from their murky home for 1 hour per 2 points of Constitution. After that, they begin to suffocate. They cannot regenerate while subject to suffocation from being away from their swamp for too long.